Our pay as you go classes are £7.00 per person per lesson. We suggest a Minimum spend of £21.00per person as we feel three lessons will give you a better chance of picking up at least one of the dances over this period. Classes are not Transferable or refundable once the first lesson has taken place. Buy an early Birthday, Anniversary, wedding or Christmas present today and learn to dance. Our training discs are packed with unique features and tools to give the beginner the confidence to get out there and dance. Whether you attend classes or not these discs will help you on your way. Just follow the step by step guides that will progress into the music so you can really master the dance routines. And see exactly the movements and steps with our unique multi view system. On screen menus are presented during lessons so that you can repeat sections until you get it. Make that first step and let EASY STEPS get you started all from the comfort of your own home! Well put together with clear instruction, and easy to jump from one section to the next, also good as a refresher. This DVD shows you step-by-step how to dance four important dances, 2 ballroom & 2 latin. The presenters show in a relaxed, simple manner the steps, for man & then lady, the hold and then together slowly, explaining as they go. Finally man & lady together to music. It's not complicated or show-style but we are mastering these beginners' steps and when we dance with friends at the next event like a wedding, they will be amazed. It's the best beginners' dance DVD we've seen and (early days at present) but we are actually learning to dance! This DVD features truly "easy steps" for any beginner to follow. Each dance is shown and demonstrated in detail and there are also useful tips about how to dance with a partner and how to respond to the music. I especially liked being able to go over a section without having to start at the beginning again. I really think anyone could pick up the basics from this excellent DVD. 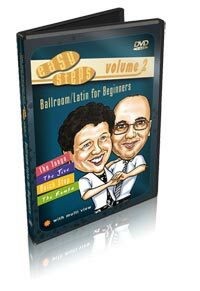 If you are a complete beginner to ballroom and Latin dancing or just want a refresher course then Easy Steps v.1 and 2 are a must. Both follow the same format and together the two DVDs cover the 8 dances that you are most likely to need on the dance floor. There is a clear and easy to follow demonstration of the basic steps and a facility that allows you to change the angle of view. If you are aiming for "Strictly" next week then this is not for you but if you want a friendly common sense introduction that will make you want to find your nearest dance class then I would thoroughly recommend them.